Defending champion Roger Federer led an express-speed charge of seeded players through the first round of the Australian Open today, with Andre Agassi also making a confident start after an injury scare. Serena Williams from the USA blows kisses to the crowd after winning her first round match against Camille Pin from France at the Australian Open in Melbourne on Monday. Williams defeated Pin 6-1 6-1. Sania Mirza rewrote Indian tennis history as she registered her first Grand Slam win and stormed into the second round of the women’s singles at the Australian Open in Melbourne today. Indian challenge suffered a blow as fifth seed Prakash Amritraj opted out of contention due to shoulder injury while sixth seed Sunil Kumar overran Kamala Kannan in the first round of the of the $ 15,000 ITF Futures tennis event here today. Bangladesh faced a daunting victory target of 374 on the last day of the second and final Test tomorrow after Zimbabwe captain Tatenda Taibu scored a fine maiden Test century. By the end of today’s play, Bangladesh had reached 98 without loss with Nafis Iqbal on 55 and Javed Omar on 36. Seamer Matthew Hoggard took seven wickets for the first time in his career as England beat South Africa by 77 runs in a dramatic finale to the fourth Test at The Wanderers on Monday. Punjab and Delhi advanced to the knockout stage of the Ranji Trophy one-day cricket tournament after all the three matches of the final round in the North Zone league were abandoned due to inclement weather today. 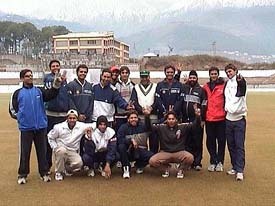 Punjab team which emerged toppers in the six-team league from North Zone Ranji Trophy one-day tournament at Dharamshala on Monday. The world rapid chess championship and the top seed at the Corus championship, Viswanathan Anand, today unexpected lost to his one-time second Peter Leko. Playing with white pieces, Anand opened with e4 and Leko replied with c5 and the game, continued in Sveshnikov Sicilian variation. An injury time goal by striker Felix Ibrebru helped Salgaocar beat Vasco 1-0 and record their first win in the 9th National Football League at the Nehru Stadium here today. The Manjit Singh Memorial Football Tournament will be held at Kharar Achharwal village in Hoshiarpur district from February 1 to 5 according to Arjuna awardee Gurdev Singh Gill. But former world number one and fifth seed Carlos Moya was a shock casualty on the opening day, falling to little-known fellow Spaniard Guillermo Garcia-Lopez. Top seed Federer raced past Frenchman Fabrice Santoro 6-1, 6-1, 6-2 in 94 minutes on the Rod Laver Arena centre court at Melbourne Park. Four-time champion Agassi, the eighth seed, worked just a little harder as he accounted for German qualifier Dieter Kindlmann 6-4, 6-3, 6-0 in a display which helped ease concern about his hip injury. “I just pushed through a bit of stiffness, and then I felt like it loosened up nicely and I was okay,” he said. Former women’s champion Serena Williams and US Open winner Svetlana Kuznetsova matched Federer’s no-nonsense approach. Resplendent in a translucent white skirt and fluorescent green shoes and top, the 2003 Melbourne champion Serena dismissed France’s Camille Pin 6-1, 6-1 in 57 minutes in the opening match of the tournament on Rod Laver Arena. Fifth seed Kuznetsova spent even less time on court, storming past American qualifier Jessica Kirkland 6-1, 6-1 in 43 minutes. While most seeds prospered, it was a fruitless day at the centenary Open for Moya, runner-up here in 1997. The 1998 French Open champion was beaten 7-5, 6-3, 3-6, 6-3 by Garcia-Lopez, a qualifier who is playing only his third Grand Slam tournament. Nothing went right for Moya. Federer, on the other hand, barely put a foot wrong. The winner of three Grand Slam titles last year, Federer picked up from where he left off as he blasted past the hapless Santoro. Federer barely raised a sweat as he reeled off the first 12 points and then opened a 5-0 first-set lead in a mere 11 minutes. Santoro, making his 13th appearance in Melbourne, complained of fatigue and an upset stomach but it was unlikely he would have made much of an impact even if he had been fully fit. The unseeded Frenchman meekly dropped his service for the seventh time to hand the match to Federer, who is bidding to become the first man since Pete Sampras in 1993/1994 to win three consecutive Grand Slam events. Last year’s Australian, Wimbledon and US Open champion was in prime form as he hammered 54 clean winners and raced around the court, showing the benefit of an extended stay in Australia. Agassi shrugged off concern about the hip injury which forced him out of a warm-up event last week as he handed Kindlmann a tennis lesson. “It held up all right. I woke up feeling the best I had since it happened,” a relieved Agassi said. “I just pushed through a little stiffness and then I felt like it loosened up nicely,” said Agassi, who is on course to meet Federer in the quarterfinals. Japan’s Ai Sugiyama was the first seeded casualty when the number 16 was upset 7-5, 6-4 by Slovakian Martina Sucha on showcourt three. Sugiyama was soon joined on the sidelines by 1995 champion and 24th seed Mary Pierce, who was beaten 6-2, 6-2 by fellow Frenchwoman Stephanie Cohen-Aloro. Serena, the seventh seed and bookmakers’ favourite, won here two years ago but was unable to defend her title in 2004 because of a knee injury. She also pulled out of an exhibition tournament in Hong Kong last week with a stomach muscle strain. Occasionally rusty, Serena doubled-faulted on the opening point of the match and dropped her serve twice against Pin but still had plenty in reserve. “Physically I’m feeling very good,” said the American. World number five Kuznetsova peppered her match with 17 unforced errors but was more concerned later to reject unproven allegations that she was a drug cheat after Belgian authorities had inadvertently pointed the finger at her and two others. Wimbledon champion Maria Sharapova blasted her way into the second round with a 6-3, 6-1 victory over 15-year-old Bulgarian Sesil Karatantcheva. The 17-year-old Russian, seeded fourth, crunched 15 winners as she eased to victory in exactly an hour. Second seed Amelie Mauresmo made an impressive start with a 6-2, 6-3 win over in-form local Samantha Stosur. The powerfully built Frenchwoman showed no sign of injury in her first appearance this year despite playing with her left thigh heavily bandaged as she raced to victory in just 68 minutes. Stosur had loomed as a tricky first round opponent for Mauresmo after reaching the finals in warm-up tournaments at the Gold Coast and Sydney but could not match the power and accuracy of the world number two. Mauresmo broke the Australian’s serve three times to win the first set then reeled off five games in a row to take the second after trailing 1-3. Sania overcame a first set loss to down Australia’s Cindy Watson 3-6, 6-3, 6-0 in the first round to become only the second Indian woman to win a Grand Slam match. Nirupama Sanjeev was the first to accomplish the feat in 1998 and she, too, scored her only Grand Slam win at the Australian Open. It was not exactly flawless tennis from the 18-year-old Hyderabad girl, who entered the main draw as a wild card which she earned after reaching the women’s singles final of the Asian Tennis Championships last year. Sania hit only 32 winners and had 43 unforced errors, including three double faults. She was broken in her very first serve of the match and dropped serves three more times. But the teenager put it down to nervousness on the big stage and said there was no worries about her form as such. “I was quite tight in the first set and was also down a break in the second set ... But I was hitting the net and not long or wide,” Sania said. “Then I concentrated on making her play, and it worked,” said the former Wimbledon girls doubles champion. From the moment she was down 2-3 in the second set, Sania began to tighten her game. She kept the ball in play, and to her luck, Watson began to make mistakes. The Indian went up 5-3 with her third break of the set in the eighth game, and from there on there was no stopping Sania as she reeled off 10 games in a row. In all, Sania converted seven out of 12 break points as against four out of 13 by Watson, another wild card herself. The local girl, nine years elder to the Indian and appearing in her home Grand Glam for the fifth time, wilted under pressure. The set times began to shrink as Sania stepped on the gas, the decider lasting only 26 minutes. She also served the only ace of the match in the last game. Sania got 34 WTA points for her first round win and moved into the sub-150 in world rankings, another milestone in her fledgling career. Nirupama, again, was the last Indian woman to be ranked above 150 which was almost eight years ago. Sania’s second round tie is on Wednesday, when she plays Petra Mandula of Hungary. A win there would most probably pit her against American Serena Williams in the third round, but the Indian is not looking too far ahead. Akshat Joshi became the first international ballkid to work on Rod Laver Arena at the Australian Open when he waited on court during the women’s singles match between Serena Williams and Camille Pin. Thirteen-year-old Akshat, from Chandigarh, is one of the 32 lucky youngsters who have been selected from thousands of applicants across Asia and flown to Melbourne to be part of the centenary tournament in an initiative designed to mark the Australian Open’s history and its growing relationship with Asia/Pacific. 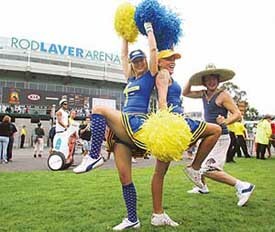 Aviva Ballkid selection trials for the centenary edition were held in India, Korea, China, Thailand and New Zealand. The successful ballkids have joined over 300 ballkids recruited during the Australian selection trials which annually sees thousands of youngsters try out for the opportunity to work at this prestigious international event. US Open champion Svetlana Kuznetsova, one of the three players at the centre of doping allegations, says she is not a drug cheat and is angry at the Belgian authorities who inadvertently pointed the finger at her. The world number five was caught up in the scandal after Belgian Sports Minister Claude Eerdekens said an unidentified player had failed a doping test at an exhibition tournament in Charleroi last month. Only four players took part in the event and Eerdekens said one of them, Belgian Justine Henin-Hardenne, had been cleared, putting the spotlight on the other three, Kuznetsova, fellow Russian Elena Dementieva and Frenchwoman Nathalie Dechy. All three women have pleaded their innocence and the International Tennis Federation (ITF) and the Women’s Tennis Association (WTA) say they have not been informed of any positive test. Kuznetsova, one of the favourites to win the Australian Open, said the trio had been tarnished by the Belgian accusations. “I think definitely it’s unfair,” she told a news conference after thrashing American qualifier Jessica Kirkland 6-1, 6-1 in the first round today. Kuznetsova maintained her innocence, saying that she had been tested 11 times last year, and thought the other players were clean as well. “Maybe it was a mistake or maybe it was nothing serious,” she said. “I’m pretty sure that everybody’s pretty clean ... because the anti-doping programme, it doesn’t allow us to take nothing. The Australian Open has been plagued by doping scandals in the past decade and Tennis Australia president Geoff Pollard said he was unhappy about the latest rumours. Petr Korda won the 1998 Australian Open and was allowed to defend his title a year later despite being caught using steroids. 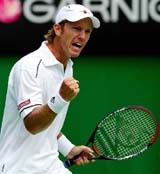 Last year’s tournament was overshadowed by a doping scandal involving Briton Greg Rusedski, who was later cleared of any wrongdoing. “I think at the moment it is a premature announcement,” Pollard told Australian radio. WTA communications director Darrell Fry said the association was baffled by the report and how it had been leaked to the media. “We haven’t heard anything at all,” he said. “This is not the way the tennis anti-doping programme works. The sudden withdrawal by Amritraj, who was semi finalist of the Mumbai leg of the tournament last week, weakened the Indian presence in the tournament and Ireland's Shahab Hassabi Nafez replaced him as the lucky loser. The three other ranked players on view, Sunil Kumar, seventh seed Dekel Valtzer (Isreal) and eighth seed Vijay Kannan however recorded easy victories over their rivals. Former National champion Sunil Kumar showed his form and class as he outplayed Kamala Kannan and reduce the match to virtually a no contest. In a one sided tie, Sunil overwhelmed the Chennai player 6-3, 6-3. Dekel Valtzer faced little resistance from wild carder Ashutosh Singh as the Isreali emerged easy 6-2, 6-3 winner. Vijay Kannan accounted for qualifier Yannick Nelord without exerting much. The eighth seed won 6-3, 6-3. Davis Cupper Vishal Uppal also had an easy outing as he tamed Purav Raja 6-3 6-2 without much ado. Bangladesh faced a daunting victory target of 374 on the last day of the second and final Test tomorrow after Zimbabwe captain Tatenda Taibu scored a fine maiden Test century. By the end of today’s play, Bangladesh had reached 98 without loss with Nafis Iqbal on 55 and Javed Omar on 36. Their opening partnership was Bangladesh’s biggest in 36 Tests. Bangladesh’s previous record partnership of 91 was also against Zimbabwe in the first Test in Chittagong. Iqbal played 161 balls and hit seven fours while Javed Omar faced 187 with two boundaries. Zimbabwe skipper Taibu used eight bowlers who failed to make the breakthrough in 57 overs. Earlier, the tourists were bowled out for 286 in their second innings just after lunch, with Taibu smashing 19 fours and two sixes in his 153. Enamul Haque Junior was Bangladesh’s best bowler, taking Zimbabwe’s last four wickets to finish with figures of five for 105. The 18-year-old, the man of the match in the first Test when the home team recorded their first win in 35 attempts, became the first Bangladesh player to take 10 wickets in a match when he trapped Graeme Cremer lbw for nought. Fall of wickets: 1-30, 2-36, 3-37, 4-37, 5-187, 6-196, 7-212, 8-220, 9-285. Bowling: Mortaza 19.4-7-51-3, Baisya 13.2-2-50-0, Rafique 24-9-56-1, Haque Jr 37-8-105-5, Ashraful 9-2-22-1. Fired by Marcus Trescothick's second-innings 180, they set South Africa 325 to win and then carved through their much-vaunted batting before sealing victory late in the final session to go 2-1 up in the five-match series. Herschelle Gibbs provided the stiffest resistance with 98, while the in-form Jacques Kallis was dismissed first ball by Hoggard, who ended with seven for 61. South Africa captain Graeme Smith tried to salvage the game, coming in at number eight after being advised by doctors not to bat following a blow on the head during fielding practice. He made 67 not out but was left stranded as the wickets fell at the other end. Dale Steyn was the last man out, caught behind off Hoggard with barely half an hour of light left. The innings lasted 59.3 overs. An England victory looked unlikely when Michael Vaughan, knowing that several of his bowlers were carrying injuries, delayed his declaration. England captain Michael Vaughan is contemplating legal action against International Cricket Council after Match Referee Clive Lloyd fined him the entire match fee for his "inappropriate comments" against umpires during the Johannesburg Test against South Africa. Vaughan has asked the Professional Cricketers' Association for advice regarding the legal action, according to a report in 'Daily Telegraph' today. The skipper was charged with a level two offence, a relatively minor transgression for which there is no appeals procedure -- a player can only appeal if he has been charged with a level three of a level four offence. The PCA Chief Executive Richard Bevan argued that the ICC's ruling, which came yesterday, was inconsistent with its own guidelines. "If you're going to fine somebody 100 per cent of their match fee, then that is no longer a minor offence," Bevan said. "We're going to call for a total review of the ICC's disciplinary process, insisting on a right of appeal for level one and two offences. We hope the ICC will realise that they've got it wrong. If they don't recognise that, we may be taking legal advice." 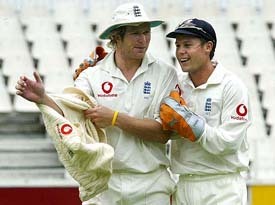 Lloyd's action has also drawn flak from many former players including Ian Botham. All the three venues in Himachal were lashed by intermittent rains accompanied by icy winds, bringing an anti-climactic end to what could have been a thrilling close to the league phase. Plans to have a shortened contest did not bear fruit as wet outfields showed no signs of drying up. Punjab had already assured themselves of a knockout berth but Delhi and Himachal were tied for the second spot. Delhi sneaked through as they had beaten the hosts in the earlier round, and also had a better overall aggregate. Himachal were to play Punjab in Dharamsala and needed a win to get through. Delhi faced Services at Una while the third match at Nadaun pitted Haryana against Jammu and Kashmir. Nadaun (Hamirpur): The one-day Ranji Trophy match between Haryana and Jammu and Kashmir was abandoned here today due to bad weather and wet patches on the pitch. The district received light to medium rain last night as well as this morning, due to which covers were put over the pitch. However, the efforts of the groundsmen to drain out water accumulated on the covers went in vain. The umpires, S.V. Ramani and S. Ravinderan, inspected the pitch along with the captains of the two teams and decided to abandon the match. The umpires said the two captains were not satisfied with the pitch conditions. Both teams got two points each from this abandoned match. The world rapid chess championship and the top seed at the Corus championship, Viswanathan Anand, today unexpected lost to his one-time second Peter Leko. Playing with white pieces, Anand opened with e4 and Leko replied with c5 and the game, continued in Sveshnikov Sicilian variation. Early in the game Anand was quick to take Leko’s knight with Nxe7 and also gave a check to the black king. Leko, however, sacrificed the knight to halt Anand’s menacing knight by taking it with Rxe7 and saved the king. Anand again gave a check on the 27th move. Leko not only saved his king but a few moves later brought his pawn to f3 giving a check to Anand’s king. On the 34th move Anand again gave a check with his queen. After the exchange of queens, Anand survived some difficult moments but in the end had to surrender after Leko proved to be stronger in the endgame. Bulgarian Grandmaster Vaselin Topolov, semifinalist at the Tripoli World Chess Championship, 2004, who defeated the former world chess champion Ruslan Ponomarov in a prolonged game yesterday, gave a fine display of tactical chess when he compelled Vladimir Kramnik to surrender in just 20 moves. Playing with white, Kramnik opened with e4 and Topolov replied with c5 taking the game to Sicilian Defence. After early exchanges, Topolov played aggressive chess and did not give any chance to Kramnik to defend. Sensing no way out, Kranmik accepted defeat and left the venue in a hush. Salgaocar failed to cash in on their advantage in the first half after Vasco were reduced to 10 men when their Brazilian recruit got expelled after getting his second yellow card. Salgaocar did more of the probing before the break and created several chances which were wasted by their erratic strikers. The pattern was repeated in the second half as the match seemed headed for a goal-less draw. But Salgaocar made amends for all their earlier lapses when a deflected shot by Rocus Lamare was tapped in by Ibrebru following a goalmouth melee.The win gave Salgaocar their first three points after their shock defeat to promotees State Bank of Travancore last week. Boys under 16-2km:- 1 Balkar Singh (Sunam), 2 Sukhpal Singh (Sunam), 3 Sukhwinder Singh (Sang). Girls under-16: 1 Navneet (Sunam), 2 Barjinder Kaur (Bararwal). The tournament being held in memory of former football star Manjit Singh, will feature top teams of the state. On the concluding day, prominent sportspersons like Arjuna awardee Inder Singh, hockey Olympians S S Sodhi and Pargat Singh and kabaddi star Balwinder Singh Phidda will be honoured. Manjit Singh, who was a leading footballer in the seventies and early eighties, had died in a road accident many years back.